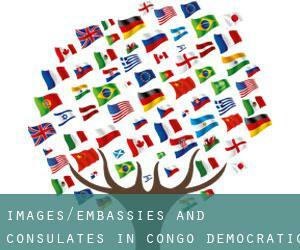 Consulates and Embassies in Congo, Democratic Rep.
Embassies and Consulates in Congo, Democratic Rep. If you are abroad and you lose your passport or identity card, you can actually go to your embassy to request that you problem a new passport and so help you return to your country quickly and safely. Consulates are the representation of public administration in the country and offer legal and administrative services. They also facilitate the relationship of citizens to their host country. Contact the diplomatic staff from the several Embassies and Consulates in Congo, Democratic Rep. and surroundings for any administrative or urgent matter you'll need. The premises of the embassy or diplomatic mission are kind of sacred. The host country authorities may not enter the premises with out the consent from the head of the Embassy. If you ever look below you might see the Consulates in Congo, Democratic Rep. and nearby towns that exist in our database diplomatic missions worldwide. We're pretty sure that the staff at Embassies and Consulates in Congo, Democratic Rep. speaks your language perfectly so you may not have any predicament communicating with them. Access to this section for a detailed listing of all Chinese consulates, embassies and representative offices located near Congo, Democratic Rep..
ConsulBy provides all Indian citizens with an updated and verified list of all Indian consular offices so they can make contact with them with any unexpected situation while in Congo, Democratic Rep. and its surroundings. Have a look using this link a collection of all US embassies and consular offices placed around Congo, Democratic Rep., just in case you need assistance whilst you are abroad. Check the Nigerian diplomatic mission in Congo, Democratic Rep., responsible for supplying assistance and support to any Nigerian person when they are visiting the country. Access to this section to get a detailed listing of all Russian consulates, embassies and representative offices located near Congo, Democratic Rep..
ConsulBy provides all German citizens with an updated and verified list of all German consular offices so they could make contact with them with any unexpected situation while in Congo, Democratic Rep. and its surroundings. Have a look using this link a collection of all French embassies and consular offices placed around Congo, Democratic Rep., just in case you need assistance although you are abroad. Check the British diplomatic mission in Congo, Democratic Rep., responsible for providing assistance and support to any British person while they are visiting the country. Consular Offices in Congo, Democratic Rep.
We have classified all embassies by nearest town. Given that Kolwezi is one of the six largest cities of Congo, Democratic Rep., with approximately 418.000 inhabitants, it's likely that hosts several consulates. The embassies and consulates situated in Congo, Democratic Rep. and exist to help their compatriots to solve any problem as if they were back property. Stick to the link to see all Embassy in Kinshasa and its surroundings. Diplomatic missions are usually in populations with greater quantity of inhabitants. With 485.167 residents Congo, Democratic Rep. is one of the most influential centers of population Congo, Democratic Rep..
We have classified all embassies by nearest town. Given that Lubumbashi is one of the six largest cities of Congo, Democratic Rep., with around 1.373.770 inhabitants, it can be likely that hosts numerous consulates. It is virtually impossible to visit Congo, Democratic Rep. bypassing Kisangani (with 539.158 inhabitants). ConsulBy presently has an substantial catalog of Consulate and Embassy in Kisangani and surroundings. Problems with Congo, Democratic Rep. authorities? Contact instantly with any of the diplomatic missions borwsed for Mbuji-Mayi to find the best solution with the local authorities. One from the busiest centers of population Congo, Democratic Rep. is, with out any doubt Kananga with 463.546 inhabitants, creating it a very good candidate to host one or more Embassy and Consulate in Kananga. The embassies and consulates located in Congo, Democratic Rep. and exist to help their compatriots to solve any situation as if they had been back home. Stick to the link to find out all Embassy in Likasi and its surroundings.